Despite the fact that 70 -75% of the earth’s surface is covered by water, hardly 1% of this is available as potable water. Hence recycling wastewater and storm water becomes more and more important as the earth’s population grows and with that the demand for potable water goes up. All life is dependant on water and water recycling enables optimal use of the limited water resources available, besides arresting pollution of existing sources of water like rivers and lakes by the waste water discharged into them. Treating waste water from municipal, industrial and agricultural use for non-potable uses such as landscape irrigation and recharging ground water in dry and semi-arid regions is sound policy that augurs well for the environment. Water recycling takes place in various stages: In the primary stage, a physical filtration process removes suspended particulate and organic matter. During the secondary stage, microorganisms are used to remove residual and suspended organic material. A tertiary step using chemical disinfectants in combination with biological processes and filtration frees the water of dissolved impurities and harmful pathogens. Increasing the level of treatment improves the quality of the recycled water. Where is recycled water used? 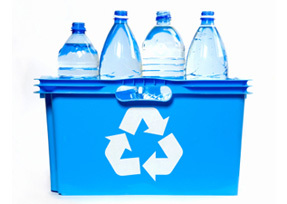 A large percentage of recycled water is used in agriculture. In urban areas, recycled water is used to irrigate parks, gardens and golf courses and in firefighting and concrete mixing. Treated water has been instrumental in recharging ground water aquifers and preventing salt water intrusion in the water table in coastal areas. Industrial units treat their effluents and reuse the treated water for cooling and processing. Skyscrapers and high rises recycle gray water to be used in air-conditioning, dust control, and watering landscapes. Recreational lakes, artificial snow making, commercial car washes and laundries are other areas where recycled water is used.